Please welcome today's guest author Rebecca Chastain! Rebecca is the author of Magic of the Gargoyles and A Fistful of Evil. Keep reading for a chance to win an ebook copy of A Fistful of Evil by Rebecca Chastain. Rebecca: I began writing as a preteen, though I’ve always made up stories. It wasn’t until I was an adult that I realized most people aren’t constantly making up little stories for themselves about the people or situations around them, or just about anything at all when they’re doing monotonous tasks. I love making up my own history for various people, which I later learned is the basis for creating characters. To this day, I still craft stories for people standing in line in front of me at the grocery store or the odd mailman, who comes on the sixth delivery day. Rebecca: Magic is the reason that I write. If I could actually do magic, I never would have become an author. I’d be a great sorceress somewhere, most likely riding an enormous horse or driving a chariot pulled by dolphins, depending on whether my powers were stronger on land or water. In the last two decades, I have never come up with a story idea that didn’t involve magic. I guess I came to the paranormal genre by default. Rebecca: If I could be any paranormal, it would have to be some form of were-animal. I’m rather partial to were-panthers, but even better would be a were-eagle. I would love to be able to fly! For supernatural talent, I would want to be able to touch an object and see everywhere it’s been. Can you imagine how incredible I would be as an archaeologist? Or better yet, think of all the amazing events I would be able to see that took place in the past! Rebecca: A Fistful of Evil is a lighthearted coming-into-power story of an everywoman trying to find her place in a secretive world to which she reluctantly belongs. The novel is a mixture of adventure and humor, with a fair share of evil and hot guys. While the novel is an urban fantasy, it doesn’t rely on the genre’s tropes; instead, there is a brand-new magic system, never-before-scene good and evil creatures, and nary a werewolf or vampire in sight. It’s also designed for pure entertainment, and it doesn’t take itself too seriously. 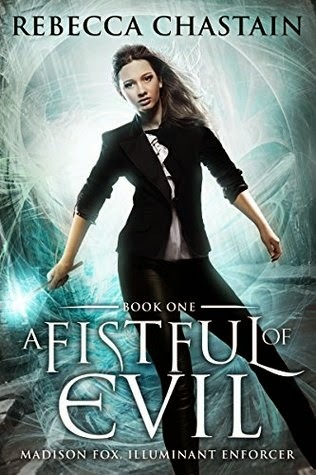 If you like a little humor with your urban fantasy, you’ll enjoy A Fistful of Evil. Rebecca: I am terrible with celebrities: I pretty much know only the big names, and most of those are too old to play the roles I’d want for them in my novel. However, if I could pick actors at any age, I think a young Sandra Bullock (around the time of The Net) would make a great Madison Fox. She’s has an incredible ability to balance action with comedy, especially physical comedy. For Niko, I’m rather partial to Taye Diggs. I’m open to suggestions for the rest of my characters, except for Mr. Bond: He would be played by my cat, of course. A Fistful of Evil (Madison Fox, Illuminant Enforcer #1) by Rebecca Chastain. On the positive side, her money problems are over, she’s possibly discovered her purpose in life, and her coworker is smoking hot. On the negative side, evil creatures now actively hunt her, and deadly experiences are becoming the norm. When she thinks it couldn’t get worse, a powerful evil sets up shop at a local hotel’s video game convention, and it’s got its eye on more than the gaming geeks: it is hungry for Madison’s soul. Madison needs to become an expert illuminant enforcer overnight to save her job, her region . . . and her life. Thank you Rebecca for joining us here today at From the Shadows! To learn more about Rebecca Chastain and her books, please visit her website. 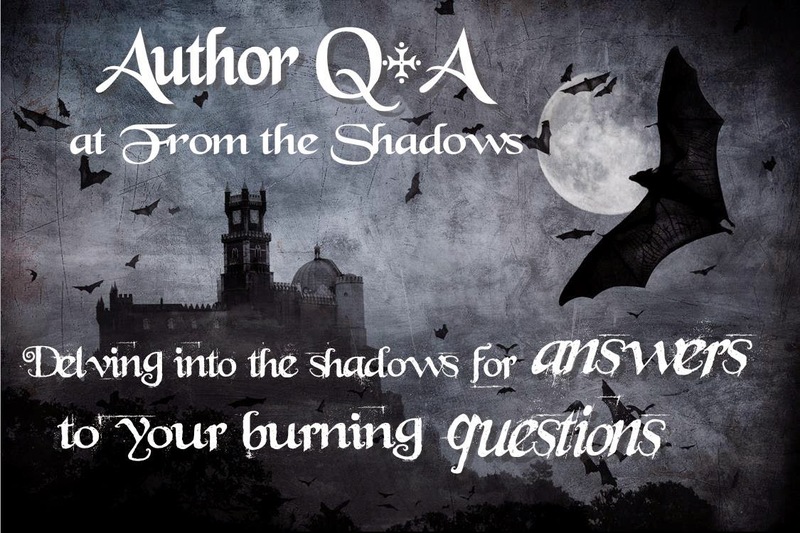 Did Rebecca's Q+A make you want to read A Fistful of Evil? If so, you're in luck. We have a special book giveaway for our readers. We are giving away one ebook copy of A Fistful of Evil by Rebecca Chastain. To enter, please leave a comment on this post, and include your email address so we may contact you if you win. This giveaway is INTERNATIONAL. Giveaway ends January 31, 2015 midnight EST. I know, right? I can't wait to read this! A fabulous Q & A thank you. Looking forward to this. I think a were-eagle would be a cool creature. The book sounds great as well. I agree! I haven't see a lot of bird shifters outside of manga. I had a lot of fun with this interview. Thank you! And thank you for hosting a giveaway! I got a chuckle out of your interview... I've gotten into a lot of things by default. Reading Paranormal is definitely the closest I can get to magic, so I totally get Chastain's answer! I'd go with a werewolf over a were-panthers any day of the week though. Shocking, I know. ;) Fab Q&A ladies! OMG! A were-Corgi would be spectacular! I'm tempted to change my answer.